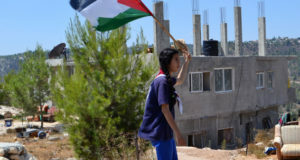 For the second Friday, over 1000 al-Khader residents, together with Israeli and international activists, joined together to protest against the Apartheid Wall and Israeli colonization of Palestinian land. 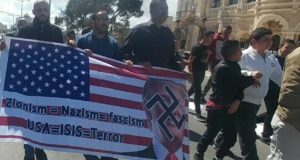 This demonstration demanded: lift the siege from Palestinian people and Palestine. The people of Al-Khader and friends gathered for Friday prayers on the main road near the construction site of the Wall, before attempting to reach the nearby Israeli settler bypass road (Route 60). 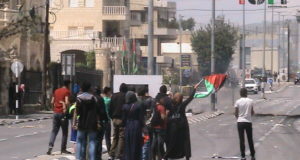 However, Israeli soldiers blocked their way. The Israeli soldiers shot tear gas, sound bombs and rubber bullets towards the protesters which made nine different people suffer difficulties in breathing. Also two kids aged 11 and 13 years old were injured by rubber bullets. If the Israeli occupation continues in construction of the Apartheid Wall and Israeli colonization on al-Khader land this will cut the Khaderian people from 20000 dunums (5000 acres) – more than 90% – of their land, and make them lose their major source of income. The construction of this section of the Wall will cut the south of the West Bank into two ghettos – Hebron and Bethlehem, and will segregate more than 73 000 dunums (18 250 acres) into the Gush Etzion settlement bloc. Al-Khader Popular Committee Against the Wall with the support of al-Khader institutions and local and international friends will keep struggling to achieve justice in Palestine. It is worth mentioning that we (the Mithaq – Cultural Forum for Development) are involved in the organizing committee of this nonviolent civilian struggle. It is our mission to work at a grassroots level to support the rights of different sectors of Palestinian society including farmers, women, youth and children. We are fully in agreement with the popular non-violent protests against the Wall and Israeli colonization of Palestinian Land, and are actively participating in this weekly event.